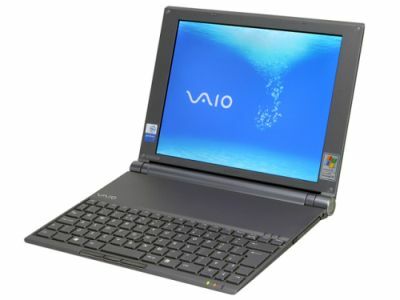 Sony VAIO VGN-X505VP is an ultra-portable, light weight and super slim laptop which is just 21mm at its thickest and 11mm at its thinnest end, and weighs just about 822g. Sony VAIO VGN-X505VP uses ten-layer motherboard and special graphite heat diffuser which eliminates the need for cooling fans to achieve its thinness and silent. The notebook computer is powered by Intel Pentium M Processor with Intel Centrino Technology and has docking port for optional docking station. Along with the laptop, bundled accessories include external DVD+/- RW, WLAN 802.11b/g card, multi card adapter & slip cover for both the notebook and the accessories. TrustedReviews reviewed Sony VAIO VGN-X505VP and gave the ultra-portable laptop the overall rating of 8 out of 10, and concluded that words like beautiful, stunning and stylish do nothing to describe the X505VP, and even the pictures accompanying this review don’t do it justice. It’s not the fastest machine out there and the price isn’t insignificant, but what you’re getting is the pinnacle of mobile computing. One day all notebooks will look like this, and for me, that day can’t come soon enough. Digital Trends (dead link) gave the Sony X505VP the score of 9 out of 10 and concluded that the Sony X505 pushes the envelope when it comes to sub-notebook design and innovation. Almost everything is unique in one way or another and Sony tops it off by adding the elegance and detail that we have only seen from companies such as Apple. The included optical mouse adds a nice touch by offering a memory stick reader, and the packaging that the X505 comes in is very stylish and retro.